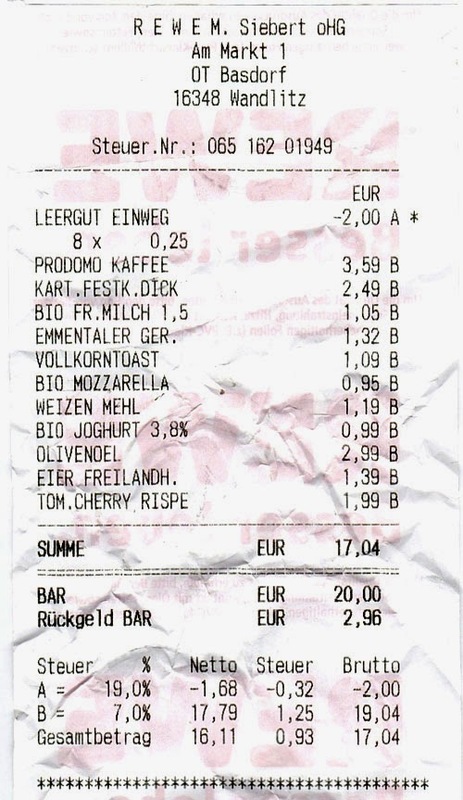 I am posting a receipt I got today at the local Rewe supermarket (click for bigger). Not because there is anything wrong with it, but because when we were looking to move to Germany we were curious about how much the cost of living would be. If there is anybody out there with a similar curiosity, then this might be of use. Also, it might be interesting if you are reading this in five years time to know how prices have changed. That comes to about 15 British pounds sterling at the current exchange rate. I also got a 2 € refund for returning 8 plastic drinks bottles. Right then, now I am off to make a pizza for dinner! before moving to berlin, we were also looking for something like this! the big things like rent or transportation are sort of easy to figure out... but little things like milk or bread or normal household things can get a bit trickier. Rewe is expensive, daaamn. I live across the street from an Aldi, which makes it about the only place I go. Besides coffee being about the same, everything else is about half the price. Interesting. Egal in welches Land man auch zieht, über die Lebenshaltungskosten sollte man sich immer vorher informieren, damit man schauen kann, ob man sich ein Leben vor Ort überhaupt leisten kann.